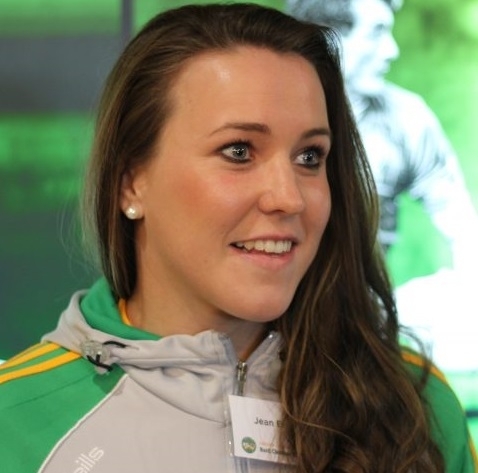 Offaly Camogie star, Jean Brady has recently joined the staff of Offaly Sports Partnership as their new Sports Inclusion Development Officer. Better known for her success on the field, Jean holds three All Ireland inter county medals at Minor, Junior and Intermediate level as well as a further three All Ireland College titles. She was twice nominated for an All Star, and captained the Offaly team in 2017. A passionate sports person, Jean enjoyed camogie, soccer and basketball from an early age. On completion of her leaving certificate in 2010, Jean went on to pursue a Degree in Exercise and Health Studies at the Waterford Institute of Technology. It was in her final year on this course that she first came in contact with the work of the Sports Partnership when she undertook her work experience module. Since graduating from college, Jean has been working in a private capacity with the Sports Partnership over the last five years delivering a range of sport and physical activity programmes. Jean is now looking forward to working with the Offaly Sports Partnership in a fulltime capacity. “I know it will be challenging”, she says, “but I am really looking forward to it”. She also paid tribute to her predecessor, Aoife Byrne who she described as an exceptional person that she has learned a lot from. “It’s great that Aoife is still working in sport, and with people with a disability through her work with the National Learning Network”.